I decided to place a buy order thinking the price will go up. I was right for a short period of time, and then the price reversed. So, I placed another buy order and waited. It did not go as I planned. The price kept on dropping and my account was losing money. I thought to myself, it would be awesome if I have a robot that knows common sense. Too bad, that robot did not exist, so I have decided to hire someone to program it for me. It is working fine now, and I have decided to put it here on the Market. Let's say I purchased 0.01 lot on EURUSD. The robot automatically count back 5 bars. Let's say the 3rd bar was the lowest bar of those 5 bars. The robot automatically place a pending Sell Stop order 30 points below that lowest bar. That pending order is automatically canceled after 1 hour or whatever hour I choose for that pending Sell Stop order to expire. 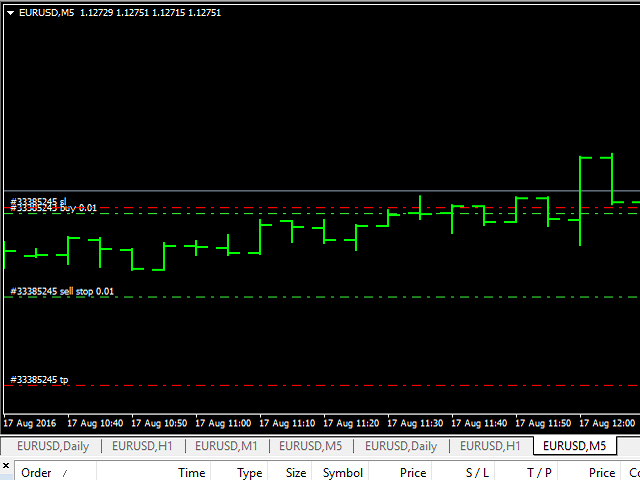 Let's say I opened two market sell orders of EURUSD at 0.01 lot each. The Common Sense Robot will automatically open one pending Buy Stop order at 0.01 lot. The robot knows there are two open sell orders and zero open buy order. Common sense tells the robot to only open one pending Buy Stop order to hedge in case the price moves the opposite direction. Let's say I opened one market buy order at 0.02 lot. Later on, I decided to open another market sell order at 0.05 lot. Let's say, I want the robot to count back 20 bars and place an order 30 points away from lowest bar or the highest bar out of those 20 bars. Common Sense tells the robot that there are a total of 0.07 lot open, there are more sell orders opened than buy orders. The Common Sense Robot places a pending Buy Stop order 30 points above the highest bar out of those 20 bars. All settings in points for a 5-digit broker, 10 points equals to 1 pip. This robot is made for ECN account only. This Common Sense Robot is an Expert Advisor.